As a candidate, Donald Trump talked about massive deportations and vowed to end Deferred Action for Childhood Arrivals (DACA), a program that has brought relief to hundreds of thousands of young adults who were raised in this country without legal status. 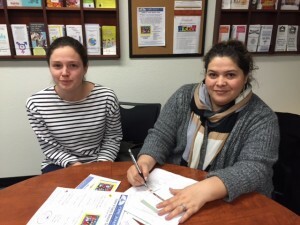 OneJustice legal fellow Maureen Slack and Orland Unified’s Neli Peña at a planning meeting for the March immigration fair. The best antidote for fear, say rights advocates, is preparation. In California cities, immigrants can usually find a qualified organization that offers free or low-cost services – including legal consultations and know-your-rights forums. But in rural California, those kinds of resources are often rare or nonexistent. In response, several organizations have been taking their services on the road in an effort to reach rural immigrant communities. Immigration clinics are being held in small towns and cities where law students and pro bono attorneys discuss how to prepare for a new and unpredictable administration. OneJustice runs the decade-old Justice Bus project that delivers services to rural parts of the state, and in recent years has held immigration clinics in towns like Tracy, Hollister and Truckee. On March 18, OneJustice will staff an Immigration Information Fair in the farming town of Orland, 20 miles west of Chico, with support from ChicoSol, Legal Services of Northern California and other organizations. The goal at the clinics is to prepare immigrants to exercise their rights and to hold individual consultations on legalization and naturalization. Among those whose lives could be up-ended by policy change is Aldo, a Chico State anthropology major who was brought to this country as a 1-year-old. Aldo, who asked that his last name not be used, found relief through DACA, which provides a two-year work permit and temporary protection from deportation. But with Trump’s pledge to end DACA, he has plenty to worry about. He’s married to a fellow CSUC student who is also enrolled in DACA and is in cancer treatment. The termination of DACA could affect their Medi-Cal eligibility and access to medical care. “Right now, it looks like we’re going to have an uphill battle,” Aldo said. That battle may be steepest in rural Northern California, an area that is culturally and politically distant from so-called “sanctuary cities,” where local law-enforcement agencies decline to intervene in federal immigration law enforcement. Attorney Holley says that in his experience, undocumented immigrants in Glenn, Tehama and Colusa counties are more likely to be arrested for driving without a license and turned over to immigration officials than in other California counties where he’s worked. But a new California law that took effect Jan. 1 called the “Truth Act” further regulates the relationship between local law enforcement agencies and Immigration and Customs Enforcement (ICE). Now, individuals in custody who know their rights can refuse an interview with immigration officials. Everyone in the United States, regardless of their immigration status, is protected by the U.S. Constitution. Undocumented immigrants can protect themselves in interactions with authorities by exercising their rights, noted Laura Flores-Dixit, an attorney for the California Rural Legal Assistance Foundation in Sacramento. The right to remain silent when questioned. “We recognize that it’s difficult to not respond to an officer in uniform who can be intimidating, and is trained to use all kinds of approaches that may be friendly or aggressive,” Flores-Dixit said. But crucial information can slip out even in “casual conversation” that can be used against you. The right to demand a search warrant before allowing officers into your home. If they say they have a warrant, ask them to slip it under the door or through a window. Do not open the door if they do not have a search warrant (signed by a judge) with your specific and correct name and address on it. The right to consult with an attorney before signing paperwork. “A lot of people sign their own deportation notices,” said Flores-Dixit, adding that it’s important not to sign anything you don’t understand. Flores-Dixit spoke at Chico State in early December and is slated to return to campus Feb. 25; immigrant families who have college-bound children are invited to that event. She says undocumented immigrants should meet with an experienced immigration attorney or someone who has been accredited by the Board of Immigration Appeals (BIA), and have a plan in place in case they’re detained. 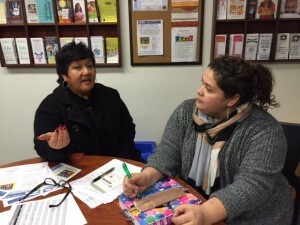 In Orland, immigrant parents shared their anxieties at recent meetings at the Orland Unified School District’s Student & Family Resource Center. As a result, Orland High will provide space for the March immigration fair “to help them get their questions answered,” said Esther Rosario, a consultant who helped develop a parent-involvement program for the district. Esther Rosario, a consultant for Orland schools, meets with the district’s Neli Peña at the Orland Student & Family Resource Center. Justice Bus clinics sometimes have a by-product: They help participants understand they can stand up to unfair policy and contribute to their community, said Slack from OneJustice. The California Rural Legal Assistance Foundation provides free telephone consultations to immigrants seeking help. Call 916-446-7901. Leslie Layton wrote this story as part of a New America Media fellowship program with support from Ready California, a cross-sector collaborative effort of legal services providers, community-based organizations, unions, faith-based organizing groups, ethnic media and more.